I was so excited to chat with Gigi Pandian about her Accidental Alchemist series and the Jaya Jones Treasure Hunt Mystery series. Both are a blend of adventure, mystery and some cozy elements. The Jaya Jones books include treasure hunts and romance, while the Accidental Alchemist books add in a pinch of paranormal and some deeper issues — immortality, anyone? Although there’s a wonderful love interest, the central relationship in those stories is the friendship between Zoe and the living gargoyle who seeks her help, Dorian Robert-Houdin. 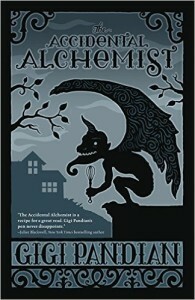 Take a look at the clever cover: yes, that is a whisk in the hand of the gargoyle. Because Dorian is not just any gargoyle, he’s a French gourmet chef gargoyle. Did I mention how absolutely charming this series is? Book two, The Masquerading Magician, came out in January 2016 and I devoured it. The next Jaya Jones mystery is Michelangelo’s Ghost, scheduled to launch in October.